Crawford ARNOLD was born on 21 Apr 1829 in Philadelphia, Philadelphia, Pennsylvania. He died about 1912. Crawford married Frances Redwood "Fanny" HOLLINGSWORTH on 2 Feb 1865. Frances Redwood "Fanny" HOLLINGSWORTH [Parents] was born on 8 Aug 1833 in Philadelphia, Philadelphia, Pennsylvania. She died on 2 Sep 1893 in "Redwood", Harverford, Pennsylvania. She was buried in Laurel Hill, Philadelphia, Pennsylvania. Frances married Crawford ARNOLD on 2 Feb 1865. Thomas Hollingsworth ARNOLD was born on 7 May 1867 in Philadelphia, Philadelphia, Pennsylvania. He died on 15 Aug 1868 in Philadelphia, Philadelphia, Pennsylvania. Wharton ARNOLD was born on 22 Jun 1869 in Philadelphia, Philadelphia, Pennsylvania. He died on 12 Dec 1877 in Philadelphia, Philadelphia, Pennsylvania. William Wharton HOLLINGSWORTH [Parents] was born on 24 Dec 1827 in Philadelphia, Philadelphia, Pennsylvania. He died on 11 May 1864 in Philadelphia, Philadelphia, Pennsylvania. He was buried in Laurel Hills Cemetery, Philadelphia, Philadelphia, Pennsylvania. William married Caroline NEWBOLD on 4 Jun 1856. Caroline NEWBOLD was born on 11 May 1828 in Philadelphia, Philadelphia, Pennsylvania. She died in Nov 1917 in Philadelphia, Philadelphia, Pennsylvania. She was buried on 5 Nov 1917 in Laurel Hills Cemetery, Philadelphia, Philadelphia, Pennsylvania. Caroline married William Wharton HOLLINGSWORTH on 4 Jun 1856. William Wharton HOLLINGSWORTH was born on 26 Jun 1857 in Philadelphia, Philadelphia, Pennsylvania. He died about 1945. Mary HOLLINGSWORTH was born in 1858 in Philadelphia, Philadelphia, Pennsylvania. F iii Josephine Horner HOLLINGSWORTH was born on 28 Apr 1860. She died about 1947. Charles Wharton HOLLINGSWORTH "Sr" [Parents] was born on 27 Oct 1814 in Philadelphia, Philadelphia, Pennsylvania. He died on 10 Jan 1853. He was buried in Laurel Hills Cemetery, Philadelphia, Philadelphia, Pennsylvania. Maurice Lovell ROBERTS [Parents] was born on 3 Oct 1922 in Robertsville, Conway, Arkansas. He died on 23 Aug 2007 in Malden, New Madrid, Missouri. He was buried in Memorial Park Cemetery, Malden, New Madrid, Missouri. Maurice married Carmon Marie. Carmon Marie. Carmon married Maurice Lovell ROBERTS. 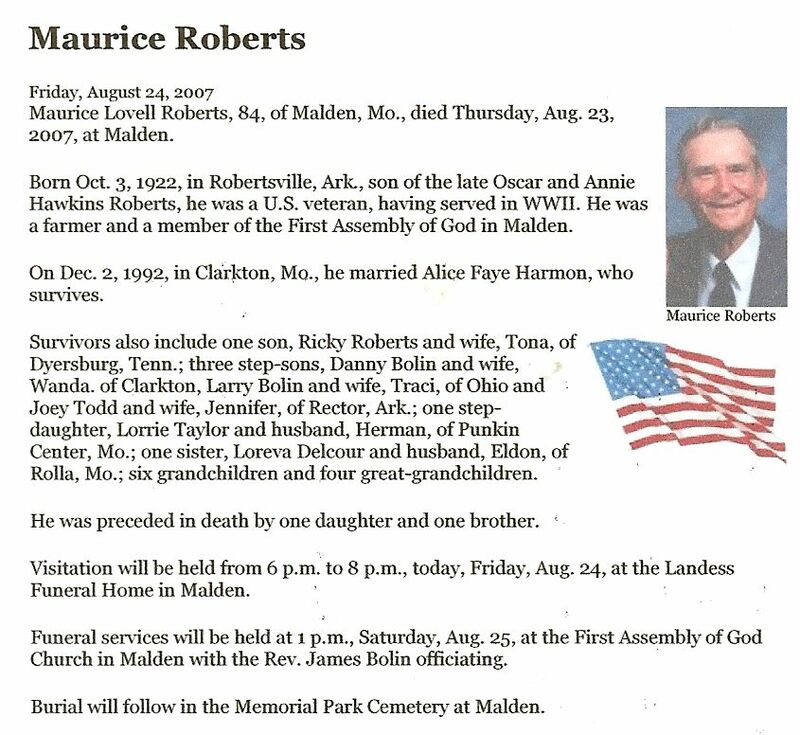 Maurice Lovell ROBERTS [Parents] was born on 3 Oct 1922 in Robertsville, Conway, Arkansas. He died on 23 Aug 2007 in Malden, New Madrid, Missouri. He was buried in Memorial Park Cemetery, Malden, New Madrid, Missouri. Maurice married Alice Faye HARMON on 2 Dec 1992 in Clarkton, Dunkin, Missouri. Alice Faye HARMON. Alice married Maurice Lovell ROBERTS on 2 Dec 1992 in Clarkton, Dunkin, Missouri. John Virgil BEGHTOL was born on 19 Aug 1887 in Vermont, Fulton, Illinois. He died in Oct 1977 in Phoenix, Maricopa, Arizona. John married Beulah Ibra BROWN in 1907 in Iowa City, Wright, Iowa. Beulah Ibra BROWN [Parents] was born on 15 Nov 1892 in Yale, Jasper, Illinois. She died on 25 Apr 1974 in Noblesville, Hamilton, Indiana. Beulah married John Virgil BEGHTOL in 1907 in Iowa City, Wright, Iowa. Samuel Harlan HOLLINGSWORTH "Jr" [Parents] was born in 1740 in Birmingham, Chester, Pennsylvania. He died in 1814 in Waynesville, Haywood, North Carolina. He was buried in , , North Carolina. Samuel married Elizabeth BOLLING about 1774 in , Wilmington, Delaware. Elizabeth BOLLING was born in 1745 in King Georges Estaes, Charles, Marland. She died in 1810 in Cedar Creek, Haywood, North Carolina. Elizabeth married Samuel Harlan HOLLINGSWORTH "Jr" about 1774 in , Wilmington, Delaware. M i Jacob HOLLINGSWORTH was born in 1775. He died in 1853. Margaret HOLLINGSWORTH was born in 1779 in , , North Carolina. M iii Isaac Shewin HOLLINGSWORTH was born in 1780. He died on 12 Mar 1866. M iv Enoch HOLLINGSWORTH was born in 1781. He died on 26 Sep 1814. Rachel HOLLINGSWORTH was born in 1785 in , , North Carolina. F vi Malona HOLLINGSWORTH was born in 1787. She died on 22 Dec 1836. F vii Ruth A. HOLLINGSWORTH was born on 28 Sep 1791. She died on 30 Apr 1874. M viii John HOLLINGSWORTH was born in 1795. He died about 1971. Jacob James HOLLINGSWORTH "I" [Parents] was born in 1742 in Birmingham Twp, Chester, Pennsylvania. He was christened in Quaker. He died on 15 May 1825 in Augusta, Richmond, Georgia. Jacob married Mary BROOKS in 1768 in Birmingham, Chester, Pennsylvania. Mary BROOKS [Parents] was born in 1750 in Birmingham, Chester, Pennsylvania. She died in 1826 in , Franklin, Georgia. Mary married Jacob James HOLLINGSWORTH "I" in 1768 in Birmingham, Chester, Pennsylvania. M i Samuel HOLLINGSWORTH was born in 1770. He died on 15 Jun 1815. F ii Hannah HOLLINGSWORTH was born on 17 May 1771. She died on 16 Nov 1844. M iii Jacob HOLLINGSWORTH "II" was born on 11 Aug 1774. He died on 16 Dec 1848. M iv Thomas HOLLINGSWORTH "Sr" was born in 1775. He died on 16 May 1836. M v James HOLLINGSWORTH was born in 1777. He died in 1824. M vi Benjamin Benton HOLLINGSWORTH was born on 21 Nov 1779. He died on 18 Aug 1844. F vii Mary HOLLINGSWORTH was born in 1780. F viii Sarah "Sally" HOLLINGSWORTH was born in 1781. She died in Jun 1815. F ix Elizabeth HOLLINGSWORTH was born in 1783. F x Susannah HOLLINGSWORTH was born in 1785. William Wilson FULBRIGHT [Parents] was born on 8 Jan 1785 in Haywood, Buncombe, North Carolina. He died on 22 Sep 1843 in Springfield, Greene, Missouri. He was buried in Hazekwood Cemetery, Springfield, Greene, Missouri. William married Ruth A. HOLLINGSWORTH about 1806 in , Buncombe, North Carolina. Ruth A. HOLLINGSWORTH [Parents] was born on 28 Sep 1791 in Waynesville, Haywood, North Carolina. She died on 30 Apr 1874 in Fulbright Springs or Springfield, Greene, Missouri. She was buried in Hazelwood Cemetery, Springfield, Greene, Missouri. Ruth married William Wilson FULBRIGHT about 1806 in , Buncombe, North Carolina. M i William FULBRIGHT was born on 26 Jul 1807. He died on 16 Jul 1881. M ii Ephraim Robertson FULBRIGHT was born on 15 Jan 1809. He died on 26 Aug 1898. M iii Levi Coulter FULBRIGHT was born on 3 Feb 1811. He died on 14 Apr 1897. F iv Rhoda Madge FULBRIGHT was born on 13 Feb 1813. She died on 28 Apr 1830. M v Henry F. FULBRIGHT was born on 25 Nov 1814. He died in 1907. M vi John Lawson FULBRIGHT was born on 11 Oct 1816. He died on 31 Oct 1882. Alexander Campbell FULBRIGHT was born on 15 Feb 1818 in , Haywood, North Carolina. He died in 1819 in , Haywood, North Carolina. Eli FULBRIGHT was born in 1820 in , , North Carolina. He died in 1839 in , , North Carolina. Kli FULBRIGHT was born about 1820 in , , North Carolina. M x David Leander FULBRIGHT was born on 30 Oct 1821. He died on 26 Jun 1876. M xi Wilson FULBRIGHT was born on 24 Aug 1823. He died in 1852. Martin FULBRIGHT was born in 1824 in , Washington, Missouri. M xiii Samuel FULBRIGHT was born in 1825. He died in 1877. Aloana FULBRIGHT was born about 1829 in , Henry, Tennessee. M xv Daniel N. FULBRIGHT was born on 14 Mar 1830. He died in 1915. Elcana FULBRIGHT was born on 2 Nov 1833 in Springfield, Greene, Missouri. He died on 10 Jul 1835. Meekly SPRAY [Parents] was born about 1825 in , , Ohio. He died before 1860 in Sullivan, Missouri. Meekly married Margaret E. PAGE on 1 Aug 1845 in , Sullivan, Missouri. Margaret E. PAGE was born on 22 Apr 1826 in , Howard, Missouri. She died on 2 Jan 1910. Margaret married Meekly SPRAY on 1 Aug 1845 in , Sullivan, Missouri.